It has been said that quitting smoking can sometimes be more difficult than quitting alcohol or drugs. This might be due to the reason that there is an emotional addiction to smoking cigarettes as well as the physical addiction. Physical withdrawal symptoms are never easy to overcome, but when you add emotional withdrawal symptoms into the mix it can get very frustrating and seemingly insurmountable. Fortunately acupuncture can make this whole process a lot less difficult. At our wellness center we have established acupuncture protocols that work to help you quit smoking in a matter of weeks, and in some cases just a few days. Acupuncture is an ancient Chinese method of treatment that has been practiced for centuries. This form of treatment is used to treat a variety of diseases, smoking cessation being one of them. Acupuncture has various effects on the body that have a direct link to the mental status of a patient. ENDORPHINS: Acupuncture promotes the release of pain relieving endorphins that promote a feeling of mental relaxation. AUTONOMIC NERVOUS SYSTEM: Acupuncture has a direct effect on the autonomic nervous system which then regulates bodily functions. NEUROTRANSMITTERS: Neurotransmitters are become balanced with acupuncture, reducing any depression or anxiety that may be associated with the whole process of smoking cessation. Acupuncture is highly individualized for all patients. We will take a complete diagnostic exam of the patient before designing a treatment plan. Every individual has different withdrawal symptoms that have to be treated accordingly. After the assessment, a combination of herbal medicine with acupuncture therapy sessions are used to overcome the symptoms of smoking withdrawal symptoms. Typically, these sessions can be taken about twice a week over the course of two weeks, and last for about 30 minutes or so, depending on your needs. So our protocol is 4 sessions, 2 x a week, for 2 weeks combined with an herbal prescription. The results are amazing! Acupuncture causes an instant reduction in the stress levels of the body. The release of endorphins in the body promotes feelings of happiness and relaxation. One of the primary causes of smoking is that people find comfort in it. Using acupuncture for stress release and comfort helps “letting go” easier. One of the major withdrawal symptoms of smoking cessation is anxiety and depression. Acupuncture treatment significantly tackles nervousness, agitation and other symptoms of mental distress. Most people find it hard to follow the cold turkey method for quitting smoking. They quit gradually by decreasing the number of cigarettes consumed on a weekly and then monthly basis. Acupuncture allows one to lower these intervals at your pace. Smoking is one of the hardest habits to quit; it takes a lot of time, effort and also money. Giving acupuncture a shot for kicking this habit can yield positive results, having no side effects also helps! At our center, we assure our patients the best available treatment through acupuncture. It is gentle, painless and highly effective. 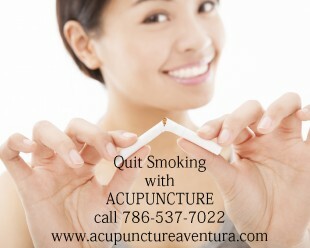 Call us at 786-537-7022 to set an appointment for acupuncture so you can stop smoking!